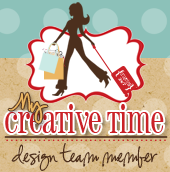 Welcome to day #3 of the My Creative Time August Release Week! Have you been following along? All I have to say is WOW!!!!! Emma and my design team sisters are really show casing this new release! I am honored and proud to be part of this team. Today in celebration of Emma's mommy, we are show casing LET'S CELEBRATE stamp & die set & the STITCHED PARTY DIES. Of course you can use these on things other then birthdays. I made this 6 by 6 layout of my husband and I when he was assigned to his new job. I kept it very simple but I just love the end result! Thank you for stopping by! Make sure you check out the rest of the design team for more sneaky peeks! And make sure you come back for our awesome Blog Hop! Big Crafty Hugs! Great layout!! I like the colors, banner and paper. Your layout is cute and fun. Your LO is precious you did a fantastic job on it. I love how you used the new set along with 2 oldies. I love it when you gals do that it show the versatility of Emma's awesome goodies. You and your hubby are one good looking couple. You did a great job on the layout! Love all the different dies that you used along with the new ones. Such a gorgeous LO! LOVE the colors, papers and of course the awesome new stamps and dies!!! Oh this layout is adorable!! I love the dies, and stamps you used!! Perfect for a celebration is that banner!! I love, love that banner! lol You ladies all have done an outstanding job showcasing this release, now I can't wait to see tomorrows!! Great card and handsome hubby! Love the bling you added to the banner and how you used it on a scrapping page. These MCT products are so versatile. Beautiful job! Such a fabulous layout Nancy! Love how you used the banner. You guys make such a cute couple, god bless! What a lovely layout--I like your use of sequins. Love your layout and all the other dies you incorporated with it. TFS! Great LO!!! Love all the pink, great use of the banner die! I can't wait to get my hands on this one! Very excited about the hexy dies! Love your picture! The layout is just beautiful. Thanks for sharing. Great layout love the way you used the banners and the hex dies. Too fun. Thanks for sharing. A pretty job on your layout...don't you love the little banner and bows? I like the hexy cuts and sequins you added. Great layout. Just lovely, love those shape dies! They keep getting better. Thanks for sharing. What a fabulous layout! TFS. What a nice layout for a nice looking couple. Thanks for sharing your fabulous layout....beautiful job! Have a wonderful day! I love this layout!! the papers and colors are so nice! congrats to your husband on his new job! thanks for sharing! Great LO, great papers, great picture! That's a beautiful layout!! Great job. Great tag style you created for your LO. Love how you used that tag in your layout. Awesome project. Wonderful layout. Love how you used the banner. TFS. Love the simplicity. SImple is sometimes my favorites of all. I wish I could make simple but just enough scrapbook pages! I always end up adding too much or missing something!! I love the banner! Great job & excited to see more!! You ladies are awesome! Great job on your card. I love this new banner! Your layout, while simple, truly highlights your photo and how happy you look with your husband.